Spring break discounts on flights, hotels, and transportation! You can save money on your Spring Break trips! It's time to start planning for spring break! So, before you book your trip, I did some research for you to offer helpful tools and some warnings! 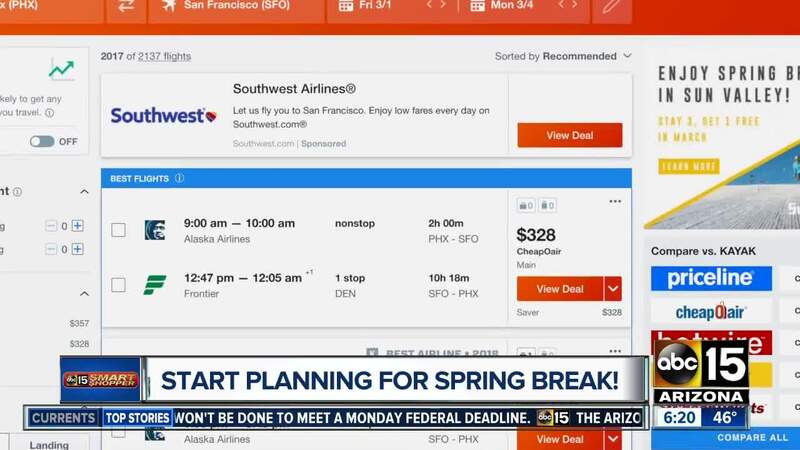 I saw an article from Offers.com , showing Expedia promoting savings up to 30 percent off with last-minute flights booked within 14 days of travel. So, we tested it, booking a flight from Phoenix to San Francisco March 1 through 4. The total price was $232, but you can't select an airline or flight time. Both are assigned after you book. We compared the same search using Kayak, and the cheapest flight was $328! So, in this case, this is a good way to save! Click here to get the promotional discount. So, I checked out a code for a rental car. Hertz had a promotion to pay for one less day, when you reserve a three-day weekend or a five-day weekly rental through April 1. I researched San Francisco. I went through the steps, but the total showed me paying for all three days, even with the promo code! So, I did the same process without entering the discount code, and it was the same price! Click here to see if the code will work for you. It may vary by participating locations. Be careful, check expiration dates for deals, and do your research to compare to make sure you're actually saving. In this search, we wouldn't have saved. Check out Hotwire's Hot Rates. We entered New York as a destination , and it showed major savings, but you will not know where you're staying until AFTER you're booked! Click here to try a Hot Rate up to 60 percent off . It's important to note; discount percentages may change since this article was written and published. In general, remember some deals are non-refundable, and you can spend anywhere from $50 to $100 in cancellation fees alone. Click here to see the full article from Offers.com. We hope you save while you book so that you can enjoy your spring break!